Native mobile apps are built with the use of native programming language of the mobile operating system such as Xcode and Objective-C with iOS, .Net C# on Windows, Java on Android, etc. Makers of mobile operating system render a native SDK that is fully incorporated with the operating system in order to go along with each and every feature of mobile device. Hassle-Free Use: Usually, people are used to go along with native apps as they are familiar with their usage. Amazing Performance and Multi-Touch: Above the base operating system, there are no layers to navigate that renders uninterrupted performance. Pinch-spread, double taps and UI gestures all can be attained with these applications. Device Hardware Access: It allows users accessing accelerometer, printers, camera, bar code readers, etc. This is useful at various business platforms. In-built Features: The geolocation, address book, camera and many other features native to the device can be flawlessly incorporated into mobile apps. Documentation Aspect: There are over 2500 books that can be counted solely for Android and iOS development with numbers of blog posts, articles and detailed technical threads on websites such as StackOverflow. Cost-Effective: Once a software application is written, it runs on different devices platforms. In this way, the software and maintenance cost of application is reduced automatically. Compatibility Aspect: As HTML5 is compatible with most of the modern browsers so these applications can be run on any browser and multiple device platforms. Dedicated HTML5 Developer is hired to accomplish this important task in an effective manner. Different UI Frameworks: In order to tackle the complicated issues, it is integrated with different UI frameworks. For instance, JQuery Mobile and Sencha Touch offer various mobile components with a huge selection of plugins that provide elaborate controls, carousels, etc. On a concluding point, it can be said that while comparing features of all these applications the thing comes that any of these applications cannot be marked the best or worst as they have their own advantages and disadvantages. For instance, connectivity for Native apps is online and offline, in HTML5 it is mostly online and in Hybrid apps it is both online and offline. Calendar and contacts can be accessed on both Hybrid and Native apps while users cannot access these on HTML5. 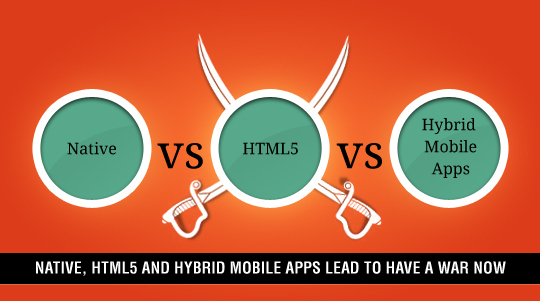 In terms of performance, Native is fast while HTML5 and Hybrid are comparatively slow. Thus, these three get success over others on the basis of user’s actual requirements.